The 400P Portable Air Compressor is the most powerful portable compressor in the VIAIR lineup. Designed to take on the task of filling 35 inch tires, it can air up a 35" x 12.50" tire from 15 to 30 PSI in just over two minutes and air it down from 30 to 15 PSI in just over two and a half minutes. The 400P is sealed for moisture and dust resistance, and it has a thermally protected motor. 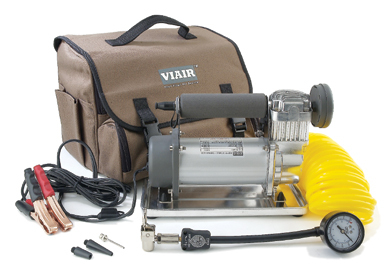 Included in the kit are an exclusive billet sand tray, 30 amp inline fuse with moisture resistant fuse holder, padded stainless steel carrying handle fitted with a quick connect stud, an 8 FT. power cord with battery clamps, and a 35 FT. inline deflator/inflator hose. With 43 FT. of reach, you will be able to reach all tires on most vehicles and trailers! Entire unit comes in a tough, water resistant double compartment carrying bag.